Happy Thanksgiving to all! 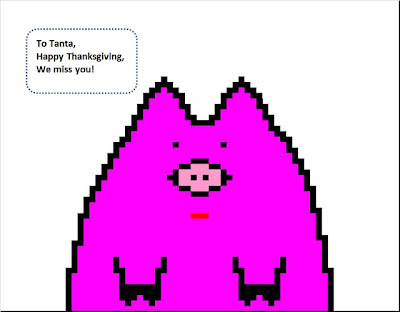 Note: Tanta is with her family celebrating Thanksgiving. Click on the Mortgage Pig™ for a larger image in new window. I suppose this requires some explanation. Many years and versions of Excel ago, I was in some interminable conference call--I believe we were discussing general ledger interface mapping for HUD-1 line items regarding undisbursed escrow items on the FHA 203(k) in the servicing system upload, or perhaps we were watching paint dry--when I experienced one of those evolutionary breakthroughs for which the human race is justly famous. I stopped doodling on my legal pad and started defacing my spreadsheet. In a word, Excel Art was born. An entire running gag developed, centered on the character of Mortgage Pig and his Adventures. The Pig you see above is a newer version; the old Pig didn't wear lipstick (old pig was developed before we started selling loans to Wall Street). You can, of course, print these images, but outside of the context of viewing them in Excel, they simply become primitive, childlike doodles of no particular resonance. Viewing them as a spreadsheet, on the other hand, makes them profoundly amusing. Really. There's just nothing like sending someone a file named "GL Error Recon 071597" and having a pig pop up when the workbook is opened for a knee-slapping good time. If you're a hopeless Nerd with no particular aesthetic sensibilities. Our own regular commenter bacon dreamz, who is also accomplished with Word Art, has (woe betide his employer) become adept at Excel Art as well, under my provocation, and has developed a way cool variation, Excel Movies. This involves creating a large number of worksheets with tediously copied and edited images that, when you ctrl-page down rapidly, create crude animation. It takes a very long series of conference calls to produce a really good Excel Movie, but it can be done. Unfortunately they're hard to display on a blog post. You'll have to take my word for it that they're hysterical. Here is a Mortgage Pig™ exclusive: "Raindrops Keep Falling on My Pig" starring the Mortgage Pig™ by Tanta. This Excel Movie is from December 2007 - and remember to press ctrl-page down to animate the movie! Raindrops Keep Falling on My Pig (Warning: this is a 2 MB Excel File). note: for those that don't know, my co-blogger Tanta is undergoing cancer treatment and has been unable to post.